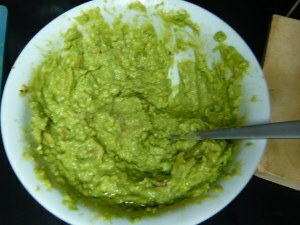 Guacamole is originally a Mexican recipe made from mashed-up avocadoes. As there are plentiful of ripe and tasty avocadoes in Costa Rica, we include the recipe here. Also, this version includes a bit of tomato and lemon juice to jazz it up. Mix the ingredients in an electric blender. Process until the mixture is lumpy. Serve with tortillas or chips as a snack. If you don't eat the guacamole instantly after preparation, put the avocado seed into the mixture to prevent darkening.